What I have discovered through Bingham’s portraits is a winding story that is just beginning to unfold. By using Bingham’s portraits as guideposts, I have found an inroad to history that has charmed me and has the magic to keep me going…Art has the potential not only to make history “user friendly” but also to direct us to yet undiscovered aspects of our past. What I had also discovered was that many portraits were lost. So, with the help of the Jackson County [Missouri] Historical Society, we sent out a plea via the society’s journal. From civic-minded art collectors and dealers, word of the locations of the “lost” portraits slowly reached me. The Clay County Historical Society took the project to heart, too, and found and photographed Bingham portraits of Clay County pioneers. I interrupted my search to attend graduate school, but possible new Bingham portrait were brought to my attention. For a class in connoisseurship, I studied one portrait intensively. That study led to the Evolution of an Art Detective. Also in 2010, I was asked to help curate the Bingham Bicentennial Exhibit, Steamboats to Steam Engines: George Caleb Bingham’s Missouri, 1819-1879, at the Truman Presidential Library (March 10 – September 8, 2011). Two years later, came the moment I had been preparing for for more than a decade: the opening of a museum devoted to George Caleb Bingham. The opening / permanent exhibit at the Truman Courthouse in Independence, Missouri, George Caleb Bingham: Witness to History questions the oft-repeated notion, that first appeared in the 1950s and keeps being repeated, that the quality of his work declined after the 1840s. The chronological exhibit considered the effect of Civil War and Reconstruction on Bingham, and on the people of the Midwest. Near the end of his life, Bingham portrayed himself as a puzzled witness. The exhibit posed a new question: From the perspective of the 21st century, how should we judge the artistic legacy of George Caleb Bingham? 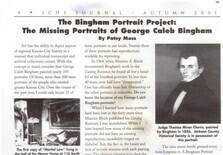 With nearly all of George Caleb Bingham’s lost portraits found, and after nearly 20 years of studying the Missouri Artist, I am preparing a book on how the artwork and stories behind the portraits of George Bingham reveal a new history: the ‘forgery” of a mid-western identity in order to allow neighboring former Union and Confederate sympathizers to function together after the Civil War. A thorough study of Bingham’s portraits unmasks resentment and racism hidden beneath the forged identity — and may unmask a potential solution.